Did you know that, on average, about 15% to 25% of the food we purchase, ends up in the dumpster or compost bin? What a waste. What can we do about it? Be sure to watch the Vancouver, BC based documentary “Just Eat It” for more insightful information about food waste, but in the meantime, let’s start whacking waste within our own refrigerators. Leftovers. It’s a constant issue these days when we try to cook a variety of daily meals for our families. The challenge is … How can we use all of the leftovers? How can we transform them into tasty, time-saving meals? and .. How can we avoid throwing anything edible away? My solution to the above questions, is to do regular editing of our fridge contents. If I don’t sift through the fridge often, then I end up at the end of the week with a large mis-mash of items that need re-purposing or composting. If I do end up with a bundle of leftovers by Friday, then I make sure to empty the fridge and sort those items BEFORE I go grocery shopping. Otherwise the leftovers get pushed to the back shelves, and grow into green-fuzzy-science-experiments. Ya, I know you’ve been there, seen that. Friday just happens to be my day to make sure that the fridge is sorted, because it’s payday, running errands and shopping day. This is how I cleared my fridge to get it freed up for a Friday. I started with pulling out all the leftovers and putting them onto the counter. Leftovers out on the counter for inspection and direction. L to R … I had Asian rice, pasta meat sauce, Borlotti beans, partial jars of salsa verde, salsa, & a drizzle of Franks Red Hot Sauce, cottage cheese, broccolette, a tiny bit of feta, jalapeno & poblano peppers, 1/2 onion, garlic … and it’s at this point that I felt a Mexican theme emerging for my leftovers. I put the Broccolette back in the vegetable crisper (after I washed the crisper out) singing, “One of these things is not like the others”. In case you aren’t familiar with Sesame Street, the 4 stalks of Broccolette didn’t fit my leftover Mexican theme, but would be fine for a smoothie, or tomorrow’s lunch salad. Next, I pulled out some of my canned Tex-Mex sauce from the pantry, and a package of tortillas from the freezer. 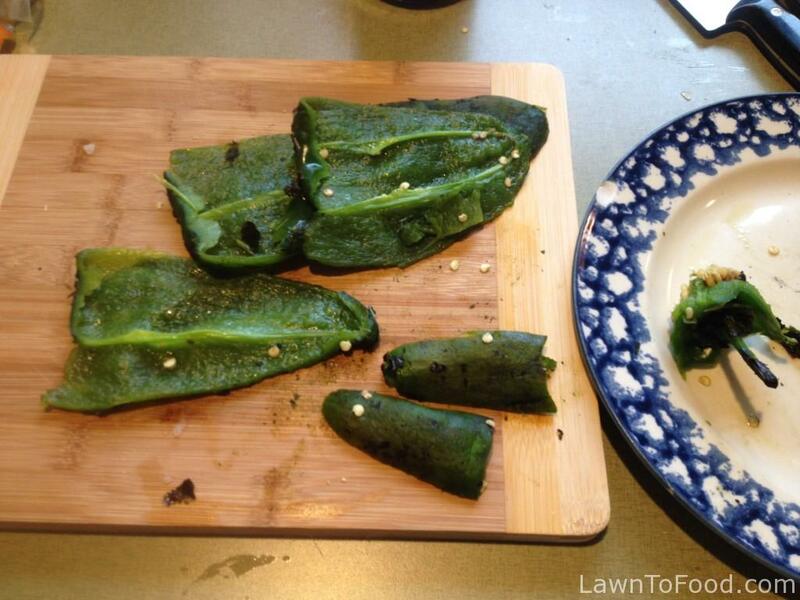 I roasted the jalapeno and poblano peppers on my gas stove burner. I absolutely love the smell of roasting peppers … it takes me back to Mexico every time the skins start to bubble, char and crackle. Once the skins were blistered, I scrapped them into the compost bucket and diced the flesh into cubes. In a large bowl, I added the diced roasted peppers, Asian rice, meat sauce, beans, chopped onion, smashed garlic, leftover salsa and salsa verde and rinsed out the Franks Red Hot Sauce bottle by adding a bit of water and poured it all into the bowl. Next, I added the cottage cheese and crumbled feta to the mixture. At this point, I tasted the concoction and decided that it needed both salt and spices. Sea salt, smoked paprika, cumin, and some ground coriander (cilantro) fit the bill perfectly. I had a fairly large bowl of mixed up “Mexican” themed leftovers and decided that an Enchilada-Lasagna would be an easy, yummy way to use it all up. 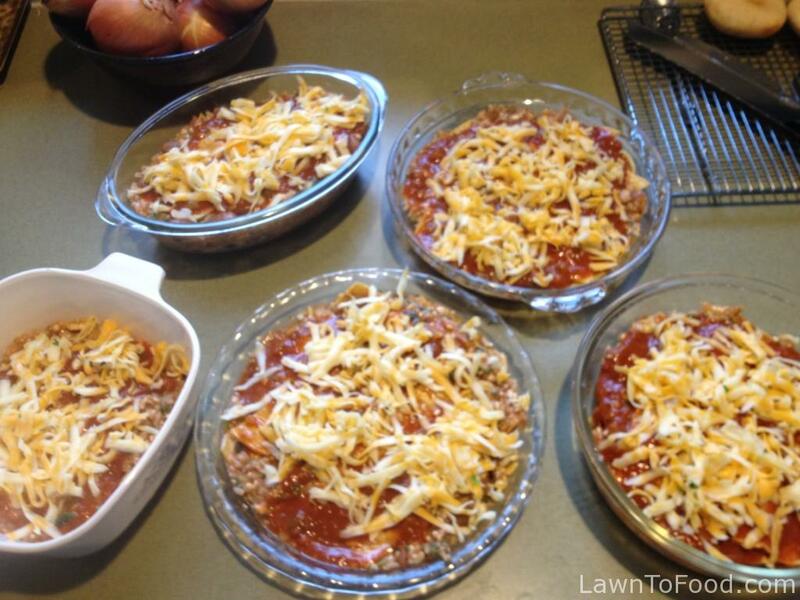 I cut the tortillas up into strips, similar to lasagna noodles, and divided them evenly between 5 casserole dishes. 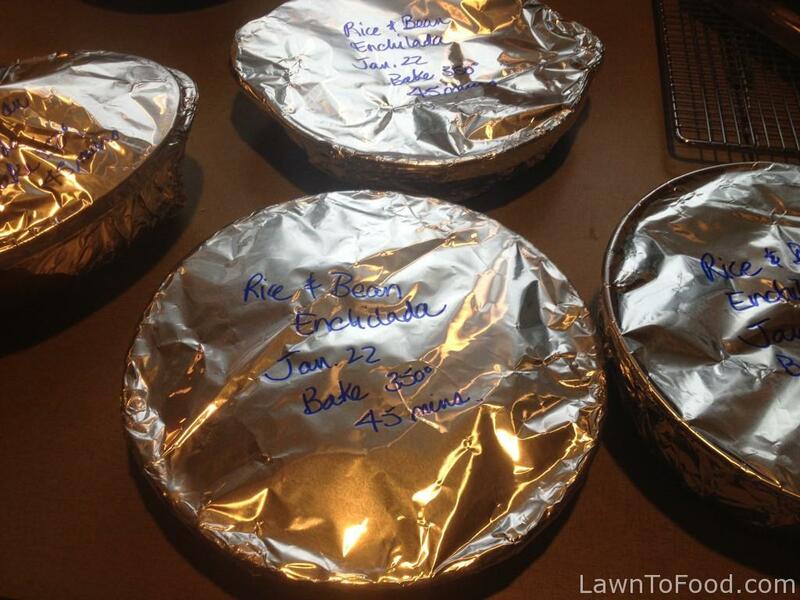 I collect cheap glass pie plates, pizza pans and casserole dishes, at summer yard sales for this purpose. Being able to freeze my already-made-ready-for-the-oven casseroles, lasagnas, quiches, shepherds pies, etc., is my way to have convienence foods without paying the high price, and/or ingesting the questionable ingredients, of store-bought ready-made frozen foods. After the tortillas were evenly divided between the pans, I began building lasagna-type layers with the Mexican rice-bean-cheese mixture. After the layers were completed, I drizzled the casseroles with my 2014 canned Tex-Mex sauce and gave each one a generous sprinkle of marble cheese. Perfecto !! Within a few minutes I was able to “Free up my Fridge for Friday” and have five entrees ready for the freezer and then future feasts or fiestas. Ole’! As soon as these sealed casseroles were popped into the freezer, I throughly cleaned my fridge shelves, getting them ready for fresh food supplies. 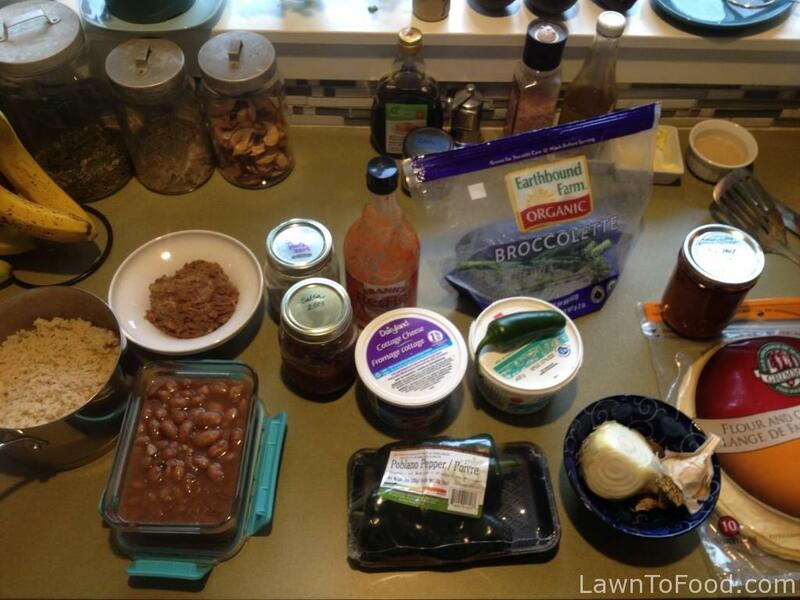 What are you going to create with your leftovers, before they have to head to the compost bin? Is it good, or sad that when I looked at your leftovers I first thought, “Mexican Lasagna”? 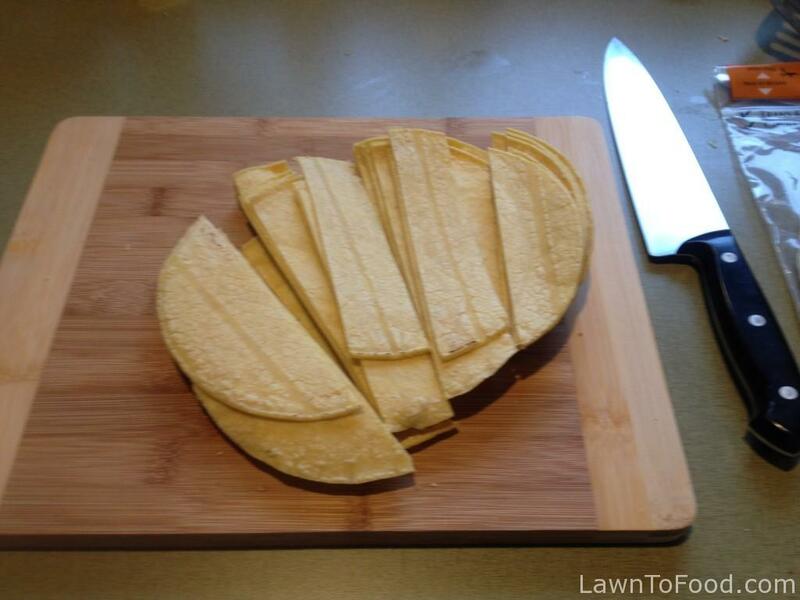 I don’t chop up my tortillas though – too lazy. It’s a “good” thing 1) ’cause Martha said so 2) ’cause great minds think alike 3) ’cause anything “Mexican” or “Lasagna” is ummm, ummm “good” … PS. 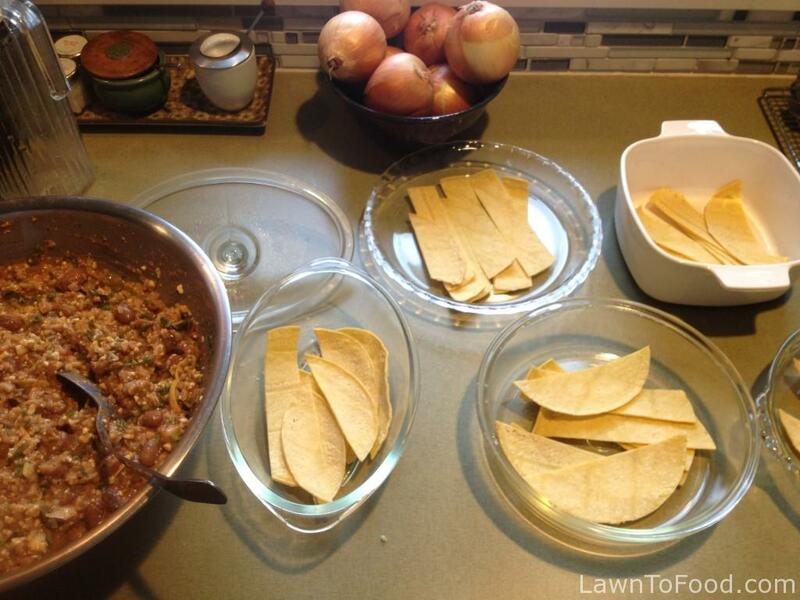 not chopping your tortillas, especially for the round-shaped pie plates is, well, ok … fine … I will say it out loud … lazy. I mean brilliant, and why didn’t I think of that? Sunday, Monday, Tuesday leftovers usually turn into Wednesday and Thursday soup lol!